Branching Out: Ash today, gone tomorrow? 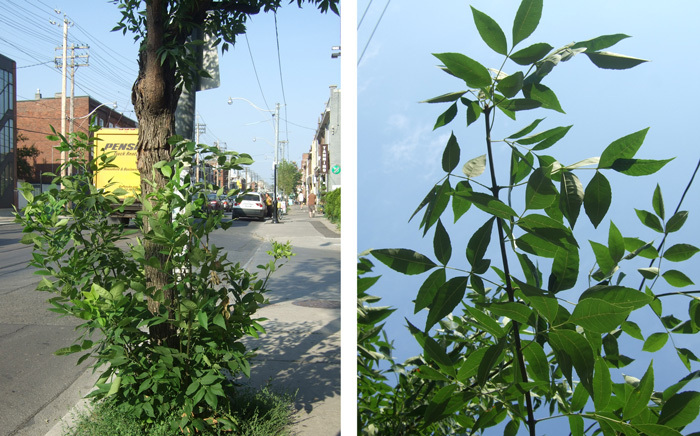 The ash trees lining a stretch of College Street in Toronto’s Little Portugal neighbourhood are beginning to look a little rough around the edges. The splitting bark, thinning crowns and epicormic shoots sprouting from the bases may or may not indicate that the Emerald Ash Borer (EAB) has taken up residence inside of these trees, but infestation is undoubtedly imminent. The Borer, an introduced pest from Asia that feeds under the bark and cuts off the flow of water and nutrients of all trees of the Fraxinus genus, was first detected in Toronto in 2007 and in York Region in 2008, and now poses a serious threat to our urban forests. 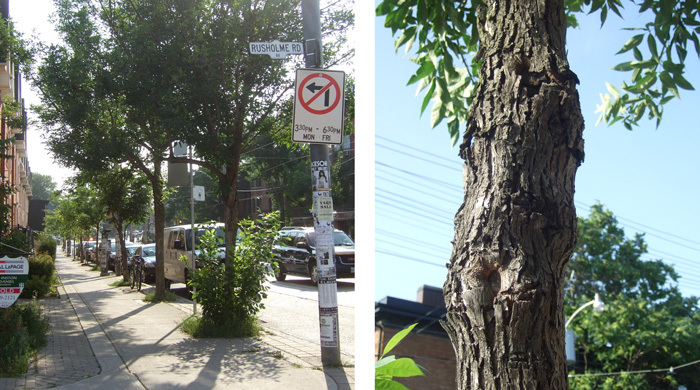 It is estimated that the City of Toronto will lose nearly all of its 860,000 ash trees to EAB by 2017 -- a number which represents 8.4% of canopy cover over both public and private land. In York Region, EAB is also expected to have a significant impact, as it is anticipated that most of the estimated 2,800,000 mature ash trees growing in the area (700,000 of which are found in the urban forest, and 2,100,000 in rural woodlands) will become infested and die within the next ten to fifteen years. While it is possible that healthy ash trees may benefit from treatment (with TreeAzin™, the only product currently registered for use in Canada against EAB, that in some cases may be able to slow infestation in individual trees), those that are already infested will succumb to the pest and the loss of trees will be noticeable – and lamentable. During a mid-summer heat wave, we obviously benefit from the shade provided by a mature canopy, but trees make urban life more tolerable in many other ways. They improve air quality by trapping pollution particles, reduce noise by acting as a sound barrier, absorb carbon dioxide and provide us with oxygen in return, reduce stormwater runoff, provide wildlife habitat and food sources, and even improve our mental health. For all of these reasons, it is important that we anticipate the loss of ash trees in our neighbourhoods and begin planting replacement trees now. To make this easy, LEAF (Local Enhancement and Appreciation of Forests) offers a subsidized Backyard Tree Planting Program which includes a consultation with an arborist, a 5 to 9 foot native tree, and full planting service. The program is available to residents of Toronto, Markham, Vaughan, Richmond Hill, Newmarket and Aurora. A Do-It-Yourself version of the program is available to residents of East Gwillimbury, Georgina, King Township and Whitchurch-Stouffville. In this DIY version, homeowners complete an online workshop and receive personalized advice from LEAF arborists via email before ordering trees for pick-up or delivery. Through both programs, it is also possible to purchase a wide variety of hardy shrubs as well as Native Garden Kits. The kits include a combination of shrubs and perennials to attract songbirds and butterflies, as well as suggested garden designs to create a naturalized, multi-storey forest in one’s own backyard! In addition to planting replacement trees, it is essential that we appreciate and maintain the trees we already have. LEAF offers many opportunities for individuals to learn more about trees and how to properly care for them. For example, The Tree Tenders Volunteer Training Program, provides 15 hours of basic arboriculture training. The program will next be offered at the Toronto Botanical Gardens from September 27 – October 5, and at the Rouge River Community Centre in Markham from October 15 – 22. For more information about LEAF and its programs, as well as information on Emerald Ash Borer, please visit www.yourleaf.org. City of Toronto: Urban Forestry. “Emerald Ash Borer.” July 2011. York Region.“The Emerald Ash Borer.” July 2011. Melissa is the Assistant for the Residential Planting Programs at LEAF. In her spare time, she pursues her interests in vegetable gardening, food, music, books and long-distance running.